Since the XC90 doesn’t enjoy the same aftermarket as the more popular cars such as the S60 or C30, it can be difficult sourcing performance aftermarket upgrades. One common source of problems are the subframe bushings on FWD and AWD Volvo models. These bushings tend to rot or tear causing inaccurate steering and lazy steering response. On my XC90 V8 wih 108k miles on it, they still looked in good condition. However, some people, especially in areas with heavy road salting or precipitation, will see these deteriorate in as few as 80k miles. 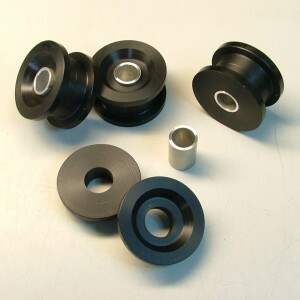 Replacing the bushings is a major operation that requires the engine be supported by a lift, disconnecting the steering rack, and dropping the subframe. The official Volvo tool to replace the bushings can save a significant amount of time by leaving the subframe in place, but the tool itself is unattainable by anyone but dealerships and specialty garages. There are various other shortcuts to removing the bushings, including using chisels to destroy the old one and remove it in pieces. This however, is messy and also time consuming. Another common problem is the short lifespan of the bushing. Even if replaced, the new ones may only last another 60k-80k miles. 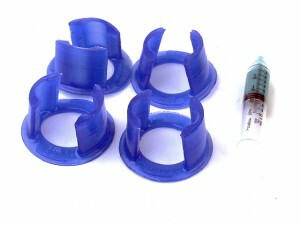 CJ Yother has manufactured Delrin bushing replacements that completely replace the rubber with a two-piece Delrin part. Once the old bushing is removed, the new one is installed easily by hand without the need for special tools or a press. This doesn’t address the difficulty in removing the bushing, but at least the replacements should last a long time. I also have an email from them stating that these bushings should fit most P2 framed Volvos, including the XC90. However, because of the material used, Delrin is extremely stiff and may transmit a lot of vibration into the cabin – especially for 5-cylinder models. For those with subframe bushings in good shape, but want to prolong the life of the bushing and stiffen up the front end of the car without removing the bushings and replacing them, IPD has a bushing insert kit. The insert is made of polyurethane and inserts into the voids in the rubber bushings. It is easily installed in 20 minutes or less with hand tools and will significantly improve the feel of the front end without the need for costly labor to remove and press out the old bushings.